Virtual reality is going to be success. That may sound like a presumptive statement, but at this stage, with all this time and financial backing poured into it, VR has to be. The real question is how, and through which platform that success will be channelled. VR is going to offer us countless experiences - watching movies, chatting with friends via chat rooms and visiting immersive new worlds, all mapped out in glorious splendor. But it's on the back of the interactive, not the passive, that VR will find its proper success. Gaming, from the simplest concept to the grandest design will be the catalyst that sees VR make it big simply because it offers us an immersive interactive we've never properly experienced before. A sensory suspension that could make playing on a flat LCD TV a little tame by comparison. Thing is, that connection to videogames has caused some people, both within the industry and without, to start viewing those incoming platforms like videogame consoles. Just like how gamers and critics have become a little too preoccupied with frame rates, there's a growing trend among VR commentators that processing 'power' is the be all and end all. Yes, it's true that the HTC Vive and the Oculus Rift - both of which are fine, robust machines that will no doubt stand as pillars of the medium in years to come - have more technological oomph under their metaphorical bonnets than any other headset. Being tethered to mandatory high-end PCs with the clout to run them having something to do with that misconception. Both will result in some of the most visually stunning and performance savvy games to hit to VR, of that we can be certain. But all the power won't count for much unless a significant proportion of the mainstream audience signs onto your product. The PC community is huge, but that doesn't mean every one of those users has a powerful rig at home at their disposal. The number of capable setups out there will still be impressive, and can no doubt match the install base Sony has built with the PS4 over the last two and a half years, but Sony has something the PC doesn't - mainstream brand recognition and a community that's growing exponentially. That concept of power above all else reared its pug ugly head again earlier in the month when Sony came right out and admitted its own addition to the new medium - PlayStation VR (or the artist formerly known as Project Morpheus) - wouldn't have quite the impressive processing power as that of HTC's Vive or the Oculus Rift. "If you just talk about the high-end quality, yes, I would admit that Oculus may have better VR," commented PlayStation executive vice president Masayasu Ito in a recent interview with Polygon. "However, it requires a very expensive and very fast PC." It shocked many to hear Sony actually go on record with such a statement, as if such a collection of words was an admission of predestined failure. But it isn't - the next few years isn't going to be the pinnacle of VR development. Despite its long history, VR's genome has been recoded and its new codex starts now. It's in the next evolution of VR that power will really matter. Right now, it isn't about how slick and smooth your software is, but how many people have ready access to your hardware and how accessible it will appear to your average punter. Sony is playing the smart game here. 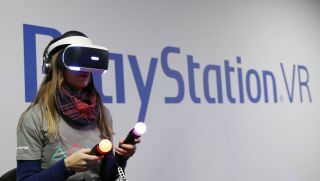 It's opened the PlayStation VR to other software possibilities (such as the recent announcement that social network vTime will be coming to the platform and Shuhei Yoshida's recent hopes for a Netflix app), but it knows that people bought a PS4 for gaming and the PS VR has to be an extension of that. Just because Sony says its console isn't quite as powerful as Oculus or Vive doesn't mean it's Google Cardboard with extra plastic and blue lights. The graphical output isn't far off what Vive and Oculus is offering at this stage and the fact it's outputting at 120Hz (higher than both than of those missions) means PS VR still has some serious performance chops. Samsung VR this is not. Just how Sony is getting all of that performance power out of a two and a half year old games console is probably a kind of black magic we mere mortals wouldn't even be able to comprehend, but the fact remains that almost 60 million PS4s sold means almost 60 million potential users. And then there's the real killer feature here - the price. At £349/$399, the PS VR is hundreds of pounds/dollars less than Oculus and Vive and for many users, however sold they might be on the prospective experience, the damage on their bank balance is the detail that matters most. Okay, PS VR doesn't come with most of the gear you need (the PS Camera and PS Move controllers are sold separately) but you can use a DualShock 4, albeit awkwardly for some games. But still, that's a far more attractive price tag if you already own a PS4 to run it. With 2016 primed to be the rebirth of virtual reality, there's no doubt that platforms such as the Vive (and all the headsets still in development) will offer some of the most versatile experiences. Tethered to the unchained overclocking power of the PC, those bits of hardware have near unlimited potential. Yes, over time PS VR will find itself bound to an ageing, closed-box console that will slowly find itself superseded by the PC development, but it still won't matter. If there's one platform that will take the medium mainstream and make it a viable market in its own right, it's the headset formerly known as Project Morpheus.